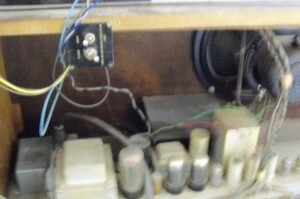 Check out the vintage electronics on this baby! Blurry -- because I was so excited! I was at the DayJob, taking one of my scheduled walk-around breaks (without which I would spend eight straight hours hunched over the keyboard and end the day looking and feeling like a gargoyle), when I came across the electronics-cleaning staff working on this. Instant nerd heaven! Really, this tech is so old that it’s practically alien. Thus, my fascination at its weirdness. We Do Not Do It Like This Any More. At least, I think they’re resistors, and not capacitors. Because I did not see any other object identifiable as a resistor. One of you out there knows the answer to that — what say? I do wish I’d gotten better pictures, but the item is no longer out on the premises. This shot is better; you can see the tubes glowing! And that vague object to the right is vague not because I’m moving, but because it is. Because that’s what it does. Justin St. Pierre's right hand provides scale. 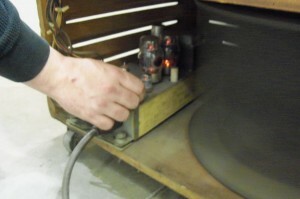 Because that component is a leslie. I had been just strolling by, minding my own business, when I was struck blind by the beauty of the electronic innards on display. 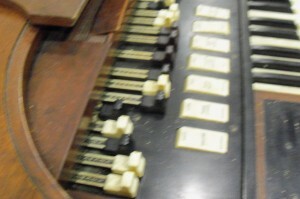 I didn’t even know it was an organ until I walked around to the front. Then: double dose of geekitude! The one guy who was on the same wavelength as me was Justin (he who also fixed my car), who is a true geek of the best 21st century sort. The Hammond was under his care, and he definitely appreciated what he was working on. So we pulled out all the stops and made some noise. 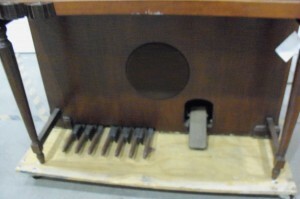 the term "stops" left over from air-powered pump organs! 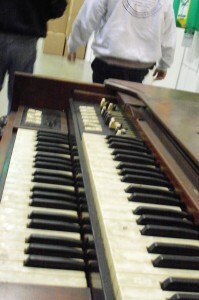 Alas, neither of us were keyboard players… that Hammond deserved, oh, maybe Billy Preston? 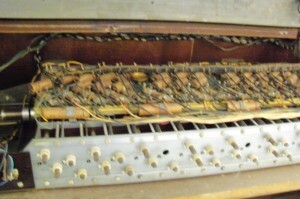 Who was it who played organ for the Doors? Someone like that. Feet pedals play bass notes! Seriously, I was so thrilled to see this. And it got me thinking — exactly why was I that excited? Three at once! Triple dose of gladness! There is something that hits all my geek points at once. Well. That explains a lot. 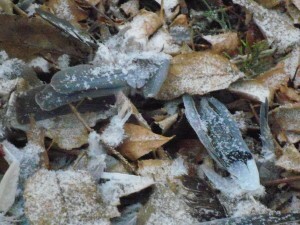 Seen near the bird feeder earlier today. I had a lovely Xmas, thank you, and hope you did, as well. My lovely Xmas featured mainly focusing on writing. Sabine has gone up to cat-sit for some friends in New Hampshire, leaving me all on my own with the whole house to roam in, with no now-I’m-writing/now-I’m-not barriers whatsoever. This, to me , is heaven. I got a lot done! Can’t discuss the details, of course. But I did default to my 8PM to 4AM favorite and most productive creative hours. Love it. It’s like having two Christmases! Meanwhile, back at Mondo Condo, the imminent snow has brought rarely seen visitors to the heated bird bath and the feeder. 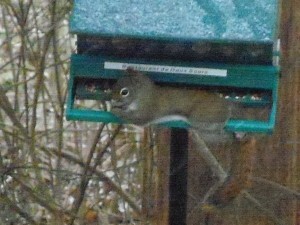 Yes, it’s a squirrel, but it’s a red squirrel. Being smaller and daintier than the honkin’ great gray squirrels. And weighing less. And thus not tripping the automatic shut-the-feeder bar. Allowing her to stretch out full length across the entire feeder, thus preventing everyone else from getting any food at all. Until I chased her away. So everyone had an Xmas dinner that could not be beat. I hope that your holiday was as peaceful, joyful, and delightful as mine. …in the list of authors I posted a few posts back. I have no explanation for the omssion, other than that I was in a rush, and about to hurry off to the DayJob. Anyway, it’s not too late to add Jo Walton books to your gift-shopping list ! Seriously, I just bought the Kindle version of Among Others. Even though it’s not out yet. Because sometimes the Kindle version comes out first, and I don’t want to wait. As soon as it’s released, zing right on to my Kindle reader. I’m probably in no danger of having bought something for myself that someone else has bought me for Christmas, because if they buy it for me, they’ll probably buy the hardcover. Which I would be happy to have. 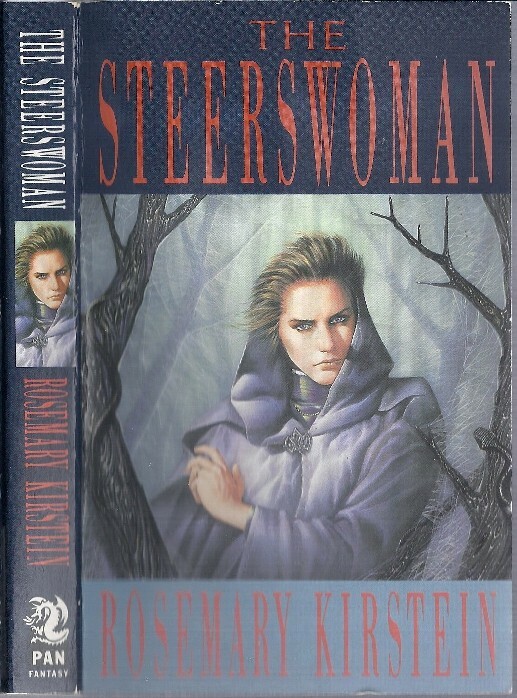 Over in the comments, Jo Walton and Michael_gr reminded me of some issues that came up when The Steerswoman was first released. One of which was: Market it as science fiction, or as fantasy? I couldn’t help wondering, at that time: If people think it’s fantasy, then when those who prefer fantasy realize somewhere down the line that it’s realy science fiction, will they feel cheated? 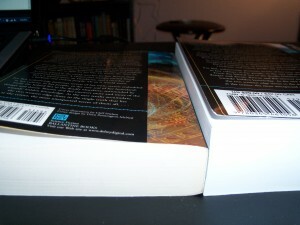 But on the other hand, if people assume it’s fantasy, those who prefer science fiction won’t even pick it up at all! And won’t this totally screw my sales numbers? When I asked Pan why they made that choice, they said that they believed that women would especially like the book, and “more women read fantasy”. That’s what they said, folks. Anyway, I like both covers, for different reasons. 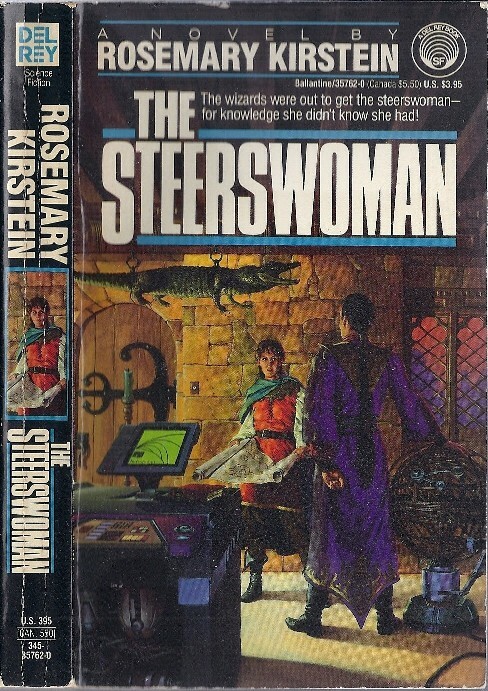 Sabine: Hey, don’t you have some copies of the Brit edition of The Steerswoman? I bet people would want that, too. Me: Um, pretty sure I only have a few copies left. Sabine: I thought you had a bunch. Me: Don’t think so… Wait a minute. (Goes into basement, looks at every box. Grumbles. Comes back.) No, I only have the handful of copies on my shelf. Sabine: Oh, well. That’s too bad. Pal Brian in in comment queue: You might want to mention that you have a near infinite supply of the English edition “The Steerswoman”. There may be people out there who would like to have a copy. Seriously, I would have told you before, if I realized I had them. I thought I didn’t! 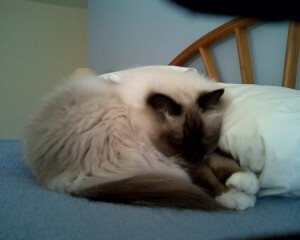 I blame Nyquil, Dayquil, and my DayJob, all working together in concert to Keep Rosemary Stupid Just Before Xmas. But the copies are here, if anyone is interested. I’ll charge $15, which will include Priority Shipping (two to three business days, meaning if I mail tomorrow, they arrive Tuesday or Wednesday because of the weekend) within the US and Canada — foreign shipping, or Express would cost more. Apparently, that was a good idea. 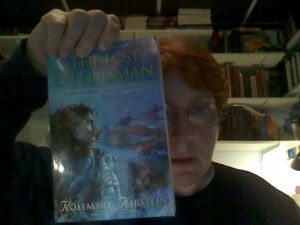 There seems to be some actual interest in the copies of The Lost Steersman that I have on hand. Who knew? As of tomorrow, copies will be winging their way across the country to various new homes. The illustrious Skwid has pointed out in the comment thread that The Lost Steersman is out of print. There are still copies available online, through Amazon, but they’re mostly second-hand. 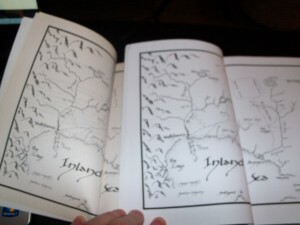 However, I do have a number of copies, pristine and uncirculated, that I’m willing to sell. I’m figuring $20, which would include priority mail shipping. Anyone who’s interested — email me at rosemary.kirstein@gmail.com and we can work out the details. c) I actually write books! You’re here because you like my books; and you like your friends; so why not put them together ? Also: In general, the more of my books that get sold, the better I look to my publisher, and the more likely they are to buy & publish the next book in the series. 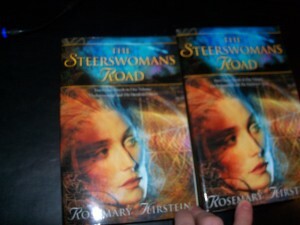 Frequently asked question: Hey, why does The Steerswoman’s Road cost twice as much as the other books? What’s up with that? A: It’s two books in one. It’s twice as big. 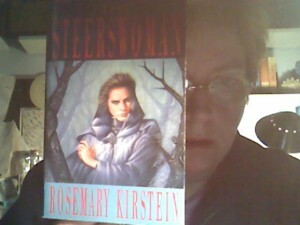 It’s The Steerswoman and The Outskirter’s Secret in one volume. Q: Yeah, but I remember that it used to be the same price as the others! , and got it into stores just before those two books hit the stands. Thus to tempt readers, and get them hooked on the whole series. Alas, that time has passed. But when they increased the price, they did something else too: It’s a better edition. Seriously: better paper, larger size, nicer all around. I went and bought a copy myself, just to check, and it really is better. But I’d like to remind you, too, of the books not by me that have been mentioned here — these are all fine authors, so why not share them with your friends? Ack! I’m out of time — I’m doing this over lunch at work (yes, I dragged myself to work). Nyquil ™ all night and Dayquil ™ all day. I should buy stock.